Kingston Courtyard White China Vessel Bathroom Sink with Overflow Hole EV4220: This White China Vessel Bathroom Sink w Overflow Hole is built to last. The highest quality standards are used to precision manufacturer a top of the line product. Important features of this BRAND NEW Fixture: Complete Item! Everything necessary for installation is included. Matching Accessories Available - Easy to Install - Installation instructions included - White China Vessel Bathroom Sink with Overflow Hole - This uniquely-designed vessel sink features a skewed square-shaped basin which descends inward to the drain hole at the center base. 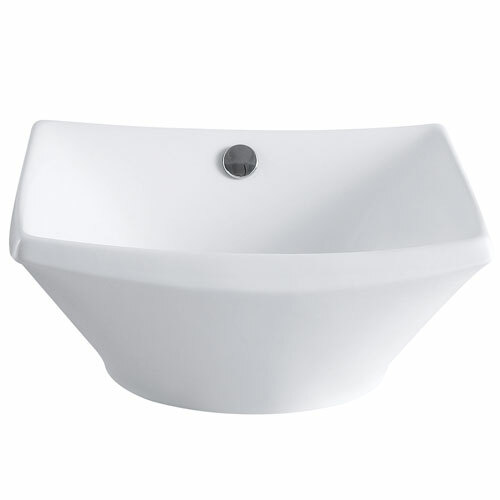 The depth of the basin is 5-5/16-inch with 16-1/2-inch length and a 15-1/4-inch width. Made from fine vitreous china, the outer contours of the sink complement the curved inward construction of the basin providing a subtle look for your bathroom. - Tabletop mount - 16-1/2-inch x 16-1/2-inch x 7-7/8-inch exterior - 15-1/4-inch x 15-1/4-inch x 5-5/16-inch interior - 1-3/4-inch drain hole - Drain not included - White premier finish designed to resist fading and tarnishing. This fixture is manufactured by Kingston Brass and is part of their Courtyard collection. This uniquely-designed vessel sink features a skewed square-shaped basin which descends inward to the drain hole at the center base. The depth of the basin is 5-5/16" with 16-1/2" length and a 15-1/4" width. Made from fine vitreous china, the outer contours of the sink complement the curved inward construction of the basin providing a subtle look for your bathroom.